The Never Summer Snowtrooper is the evolution of the SL with blunted tip/tail, slightly more centered stance, and different sizing. For us, the West was more of our kind of all mountain board but the Snowtroper is not a bad ride either. Other than a few minor improvements to the top sheet and core, the 2015 to 2019 Never Summer Snow Trooper is very similar to the 2015-2018 models so the old review still stands. In this video we are demoing the 2015 Never Summer Snow Trooper with a different graphic than the production model but the rest of the board is the same. In this video, we are demoing the 2015 Never Summer Snow Trooper with a different graphic than the production model but the rest of the board is the same. Conditions: Everything from soft to pretty hard ugly snow. First off I have to start by saying that I like the graphics of the production model a lot better than the demo models. I normally don’t comment on graphics but this was pretty cut and dry. Also the new tip and tail look a lot sexier than the old SL. Weight: 157 NS Snowtrooper X 6.2 lbs but no board with a wood core weighs the same so take this with a grain of salt. On Snow Feel: Same playful semi-stable feel as the SL it replaced that makes it an all mountain board that’s mellow and playful. It feels fine flat basing and one footing in good snow. As the snow get’s firm it starts to feel loose like it want’s to spin on you. You have to keep it on edge in order for it to track well. So it has a personality that changes as the conditions get hard. If you want something that tracks better in firmer snow the West is the call. Turn Initiation: Nice quick and easy for the 156 and it felt just like the SL did. Snappy fast and fun from a short to wide radius turn. Easy but not super easy and all in all it’s not a bad board for turning all day. Nothing super springy and mind-blowing but nothing horrible either. Skidded Turns: Very easy to skid turns and it’s a very forgiving board for beginners or intermediate riders. Carving: So carving wasn’t perfect and it felt a little washy compared to the Cobra and even more so with Ripsaw Camber Profile boards like the West. It’s good enough though to have a little fun and it’s fine for the carve/butter/ollie kind of mountain ride that many people like to have. You really have to get your knees wide to get pressure over the tip/tail to hold on more aggressive turns and it doesn’t like a surfy carve as much. Flex: Usually in the demo’s Never Summer boards feel stiffer than the production models but this year it didn’t. It felt soft like the production model of the SL. It’s got lots of butter ability for an all mountain board. Edge Hold: the Same edge hold that most NS boards have that helps you hold an edge in most conditions you want to ride. It’s not really an ice specialist but it can hold an edge in most hard conditions. It’s not super grabby but it does the job. Never Summers edge hold technology doesn’t grab soft snow so it’s a very versatile grip. Powder: We didn’t have any powder with the Snowtrooper but have had lot’s of days with the SL and it’s an easy floating board. Especially when it’s set back. It’s not quite as set back as the old SL that was -20mm which was the same as the Cobra but it’s still got a good float. I’d give the nod to the old Cobra but it feels like it might be a little improvement over the SL with the bigger blunted nose/tail. It’s about the same as the West and maybe even a touch better because there is less camber. Speed: You got to love the use of rubber in NS boards because they make a board that should feel much more chattery for the flex. Yeah the nose and tail flop a bit at higher speeds but it just doesn’t feel as bad as other boards that flop like this. The base carries it’s speed well. So it’s no bomber board but handles better than you would think for it’s flex. Uneven Terrain: Like so many softer flexing NS boards the Snowtrooper handles end of the day weekend resort snow like a champ. It can also weave in and out of moguls well and provide a forgiving ride. It doesn’t get angry and cause problems with your joints like some boards can. Switch: Same thing as the SL here. It doesn’t feel like it should be as good as it is riding switch. It’s somewhat different riding switch but not as much as you would think. I think it’s because this is pretty close to being a twin and the tip/tail is lifted. Jumps: It’s got a nice pop and a pretty playful spring at the tip/tail. It’s also a fun board to hit kickers in the park with. The rubbery feel in the board doesn’t feel as snappy as some boards but the result is the same. It pops just as high. Jibbing: You know it’s not a jib specialist but it’s very doable for most small to medium jibs. Pipe: We didn’t get to try the Snowtrooper in the pipe but it felt like it would be fine. Nothing special but forgiving and definitely doable. Although we prefer the extra camber of the West we still really liked the Never Summer Snowtrooper and feel it could definitely fit a wide variety of riders who want a very playful easy all mountain ride. We try to get as many images of the Never Summer Snowtrooper, but forgive us if they're not all there. Pretty much agree with the Good Ride review. I ride the 162 regular and I am a bigger guy, I would say the flex is more medium than medium soft. For a 162 its really good in the powder. I chose this over the Cobra mainly cause it has less sidecut. I find boards with really deep sidecuts less table at speed. That said its a pretty fast board that has a base that holds wax well. I'm really happy with it. Never Summer makes pretty solid boards. Only regret is that they came out with the West a year later. I ride it with Burton Genesis bindings and Ion boots. Really nice set-up. 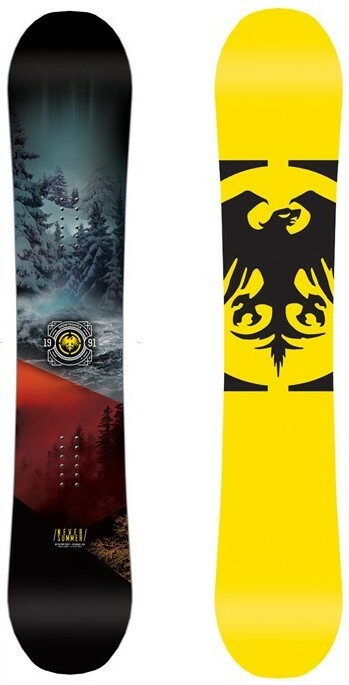 This is a really great board for all-over-the-mountain "resort-style" riding. It's better in the park than one might think, it's really easy to press and is on the softish-side, but still has good pop and isn't a noodle (that said, I huge, so there's that lol). Had-pack, groomers, pow, pipe, icy parks, thing just works (could work better as a twin, get to that in a sec). Honestly, I think it's an awesome board that's as good as nearly anything out there for an "undecided" style, all-over-the-mountain rider... Now, that is except for one huge F'up (IMHO) on Never Summer's part: 15mm set-back, huh? ...and my 164 will only allow for a MAX 24.5" stance width (ok, 24.5" is pretty-wide and I might not ever need more, but it's also what Shaun White rides on a 156, and this is a "big guy's" board in the 164cm length)? WTF!!!!!!! This is a HUGE thing, and arguably a mistake on NS's part because: IT MEANS YOU CANNOT TWIN IT OUT! F**K! - If the set-back was at 20mm it'd be fine or even 25mm to get real-close to a twin if you wanted, but w/ a 15mm set-back you've either got to ride it 15mm set-back, or next 35mm set-back, no twin! If NS fixed this one SUPER ANNOYING spec I'd give this board 5-Stars no problemo. Went out this late afternoon/dusk to purposely find some icy, hard pack snow to test out my Snowtroopers edge hold. Went to Mountain Creek, NJ and was riding my Snowtrooper 159. Conditions weren't pure Ice, but very hard packed, skied off with a dusting of the manmade on top. I hit every trail at least once and the Snowtrooper never washed out once, heel or toeside. It seems to be the same edge hold as my SL which was great. I absolutely love my SL. I have total confidence to ride it absolutely anywhere. From east coast ice to 2feet bottomless days out west. So when the Snowtrooper is advertised as a better SL, I had to have it. Picked up a 159 on Black Friday. I just returned from 4 days in Vail. We have 8inches of new snow overnight, 1-3 the second day, and bluebird groomers day 3&4. The board has noticeably more pop. Because of this, it feels more fun to jump around and on and actually feels "lighter" on your feet when riding. The board seems easier to spin due to reduced swing weight and is easier to ride switch than the SL. It feels more stable through late day chop and at speed. It is advertised to float better in powder which I tested thoroughly, but couldnt tell any significant difference between the trooper and the SL. I never had a problem with float on my SL. I haven't gotten a chance to test it yet in true east coast conditions with ice. I hope the edge hold is the same or better. I have built so much confidence bombing on my SL. The sidecut is slightly larger on the Snowtrooper than the SL. I'm not sure what effect that will have on edgehold. I had absolutely no problem in Vail. The matte top sheet is a pretty cool addition. In conclusion. I think this is a slightly better SL.